We are familiar with our clients' varying and complex flooring needs. General contractors need timely bidding and experienced project management. Interior designers need specification services. Architects often need recommendations by flooring specialists to make sure they use the right product in the right application. Commercial Surfaces has several experienced floor covering consultants to help you lay out your ideas and concepts into a cohesive design. We act as an intermediary for the manufacturers we sell, providing the estimates that they can't. We have project managers on staff with the experience needed to provide you with accurate estimates and to help you meet difficult scheduling requirements associated with large construction projects. Our experienced staff can help you write detailed specifications for large or small commercial projects, including proper maintenance specifications. We help you get the right product for the right performance in the right application, and we take into consideration all the manufacturers so we can save you valuable time. 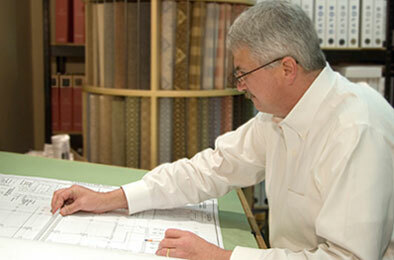 Our showroom carries thousands of samples from all the manufacturers we work with. It's a great place to begin a design concept, and we can even help you create mockups of your design. Sign up to receive information on our continuing education classes for designers. Commercial Surfaces provides consultation on specifications in sustainable LEED certified products. We have established relationships with manufacturers that offer environmentally friendly products including Milliken, Shaw, BentleyPrinceStreet, J&J Commercial, and InterfaceFLOR. If you have a difficult space or complex installation requirement, Commercial Surfaces can consult with you to design and install an innovative solution for your project. There's no need to completely empty your space to replace your flooring. Our lift system allows for faster installations and less downtime for your company. Contact us to get started on your next flooring project today. We have the specialized knowledge to be your expert flooring partner on your next commercial project. © 2009 Commercial Surfaces, Inc. All Rights Reserved.